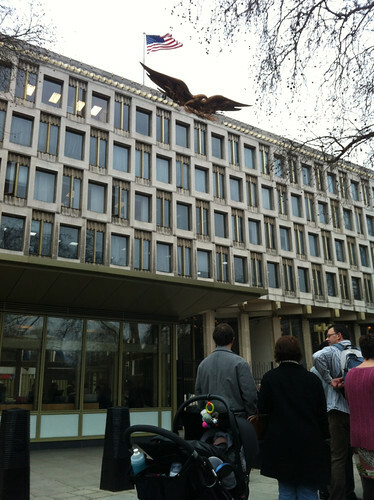 I took Junior to the American Embassy in London today to register his birth and apply for his American passport. Registering his birth and applying for his British passport were relatively straightforward activities. When registering his birth, Wandsworth Council did not even ask S or me to produce ID - they just took it on faith that we were who we said we were. Our biggest worry was how to get there, but S' parents drove us over xmas; by the time they had parked the car and found a spot for some coffee, we were done with the whole registration process. The birth certificate was free and we got 2 official copies for £7. The hardest part of the British passport application was finding a 'counter signatory' with the proper professional qualifications. We were able to use one of our neighbours, who is a Director of the freehold company for our building. The application, including special delivery return envelope and check-and-send service at the post office, cost £63. I was able to print the digital photos I took, and our neighbour signed the back to affirm that they were a 'true likeness' of Junior. 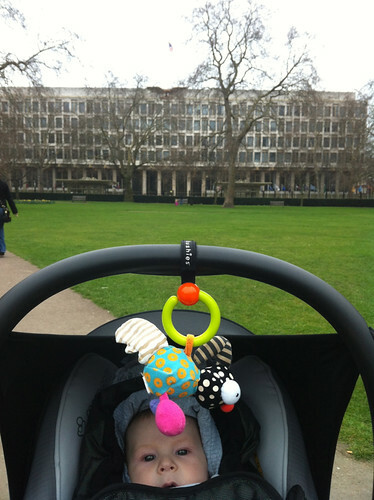 Registering an American birth abroad was slightly more complicated. I made the appointment online, one month in advance; appointments can only be scheduled at 8:00, 8:30 or 9:00 AM (!). It took me nearly all month to prepare the paperwork: consular report of birth abroad, passport application, and social security application. For the report of birth, I needed to provide my old passports as well as my current passport, to prove that I fulfilled the residency requirement to pass on my citizenship. The report of birth was $100 (charged in US dollars, so I had to call my credit card company yesterday to make sure they would not decline it). 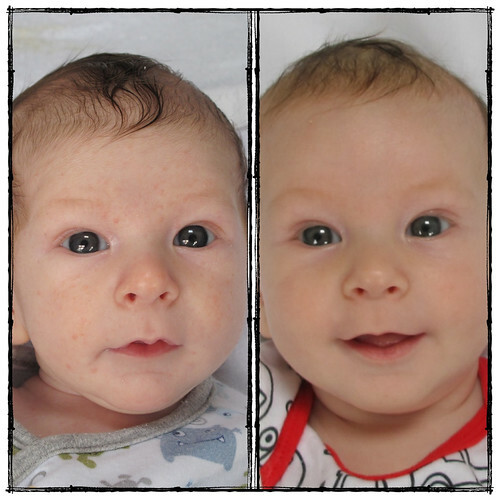 The passport application was straightforward, but the photo requirements were different from the British ones so I had to take a new picture of Junior. And the photos had to be professionally printed: another £9. 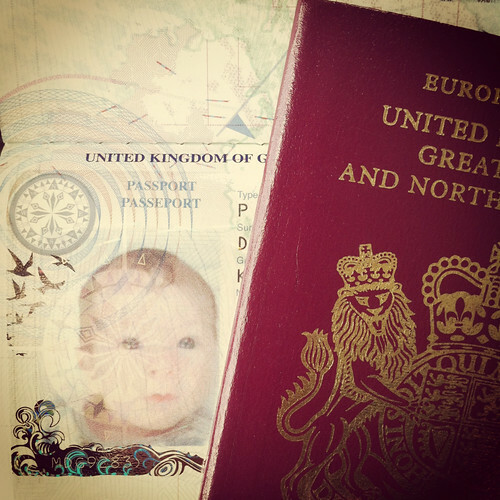 Instead of a counter signatory, the Americans insist that both parents are present to apply for the passport together. If one parent cannot attend the appointment, s/he has to complete a statement of consent and have it notarized. In S's case, this cost £100 - more than the passport itself! The passport was a mere $105 (again, in US dollars) in comparison. The social security application was free, and caused the least amount of headache. Finally, I had to bring a self-addressed special delivery return envelope: £5.90. All in all, the American documents cost just under £250. But paperwork and money were only part of the adventure. 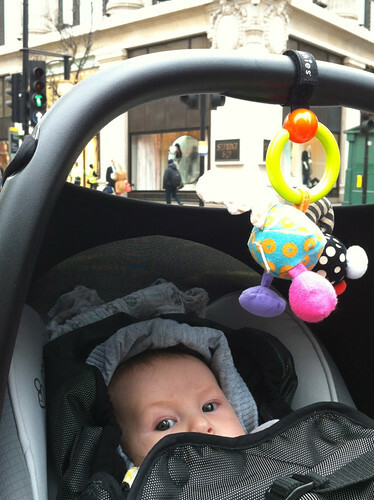 The real challenge was getting into central London on a weekday in time for a 9:00 appointment! I woke up at 4:00, showered, got dressed, ate breakfast. Junior started stirring around 5:15, so I changed him, got him dressed, and breastfed him. I tried to give him some formula but he was busy soiling his nappy - another change! 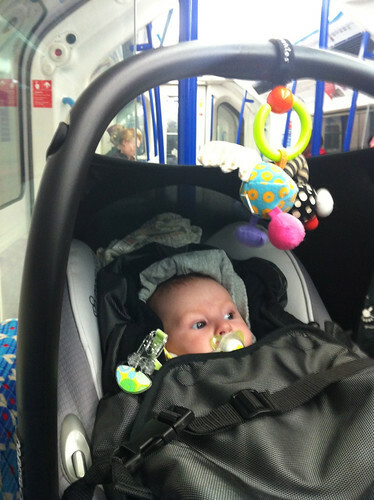 By this time, S was awake and showered so he came with us as far as Bond Street Tube. We took the Northern Line to Stockwell, then changed to the Victoria Line. We rode to Green Park, which was supposed to have stair-free access to the Jubilee Line. But the platform led us directly to a stairway, so S and I carried Junior up to the escalator. Finally we took the Jubilee Line to Bond Street and arrived just before 8:00. S left us and went to work; we stopped at the closest Starbucks where Junior took his formula while I had a chai tea latte. Around 8:20, I decided to walk over to the Embassy. I knew I was early but figured it was better than being late. Once there, I was glad I was early: the queue - sorry, line - for security was long and even the security guards were apologizing for the delays. At security, I had to give up my iPhone (wah!). Upon entering the building, I was surprised to discover that there are no ramps for strollers or wheelchairs. Fortunately, several kind people helped me get in and around. The initial wait inside was just a few minutes to turn in my documents, but then it took nearly three hours of 'go to this window', 'go to that window', 'pay this fee', 'pay that fee', and 'sit down and wait for your number to be called' before we could leave. Junior was incredibly patient and good. I eavesdropped on nearby conversations, in between reading a real book (no iPhone!) and entertaining Junior. The ride home was much easier without the morning commuters, and we got back just before 2:00 PM. Still, I'm not in a big rush to repeat the trip to central London again, especially on my own. 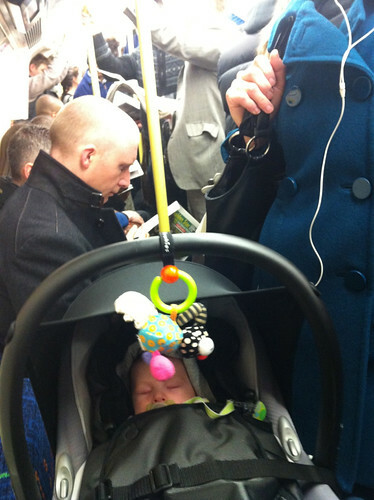 I think I'll wait until I have more confidence with the baby carrier. Now we wait for the American birth certificate and passport to be sent back. Then we need to plan some trips!